Polytunnel construction course at Sims Hill Shared Harvest! 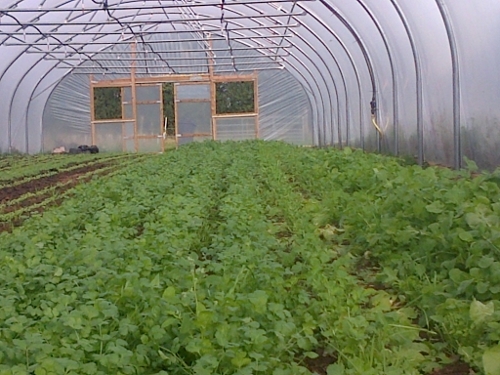 Sims Hill Shared Harvest will be offering the opportunity to participate in the construction of a professional sized polytunnel, as part of a series of practical courses run through out 2014. Participants will learn about the full construction process from bare field to end result, including basic carpentry, metal work and fitting the cover. You will also learn the benefits of team work, health and safety issues on a building site, the benefits of protected growing and Community Supported Agriculture. The duration of the course is 8 days, run on alternate Tuesdays and Saturdays begining early March (start date tbc). We would like to hear from people who are available for the whole project and who are able to do manual work for a full day in outdoor conditions. Sims Hill Shared Harvest is a community supported agriculture enterprise based in Frenchay. We grow vegetables using natural methods and employ the principles and practice of Permaculture throughout the project.